Regular visitors here will recall that last year at about this time, Mrs. KfC, writing under her real name, Sheila O’Brien, made her debut as a published author. 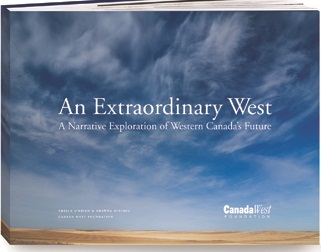 An Extraodinary West, co-authored with Shawna Ritchie from the Canada West Foundation, was based on interviews with 50 Western Canadians involved in all aspects of public policy from government to business development to culture. Those of us who have lived in Western Canada for some time (approaching 50 years, with occasional interruptions, on my part) are fully aware, as that first book identified, that our part of the world is on the cusp of an era of extraordinary opportunity — and challenge. Both that opportunity and its challenges are centred on “energy” and the West has a lot of it — the world’s second largest petroleum reserves in the Athabasca Oil Sands, ample developed and potential sites for hydro power, wind and sun enough to make us global leaders in the green energy world and all that is just a start. But, as events this week with the U.S. decision to delay approval of the Keystone Pipeline confirmed, that opportunity comes with a challenge. It is one to thing to have the potential to fuel the world; in current times, it is quite another to do that in an acceptable fashion. That is the scenario that Ms O’Brien and Ms Ritchie explore in their second book, which carries the subtitle “A Western energy vision for Canada”. They have taken the same approach as they did for An Extraordinary West, 50 interviews with individuals involved in all aspects of energy development, sustainability and responsible resource management. The subject is incredibly complex — they admit that the principal aim of their book is to explore in general terms various aspects of energy with the goal of informing and opening a broader debate. There are a lot of people who have very detailed knowledge (and opinions) about specific threads of the challenge — there are not very many who have experience with all its many streams. I can’t hope to capture their findings in a review, but I will try to identify a highlight or two from their approach that perhaps might spark your interest. One observation up front is that while the book is about the challenges facing Canada, and particularly Western Canada, the observations are very relevant elsewhere — the U.S. is currently our only export market (see that pipeline delay) and has its own set of issues; our Australian friends are facing almost exactly the same circumstances we are (and in many ways responding more proactively, as the book notes). Canada will be a supplier of choice of energy products, services and expertise to the world for the benefit of all Canadians. We will have an exceptional environmental and social record, which will continue to define our values as a nation and give us a stronger voice on the international stage. 1. Mind the Gap: Supply, Demand and the Space in the Middle: Canada has been an energy exporter (petroleum products in the West, hydro in the east) to the U.S. for three-quarters of a century and on the supply side has enormous potential to profitably expand that business. The demand side of the equation is a challenge, however — with only one export customer, Canada is at the mercy of both U.S. economics and policy, as the Keystone decision illustrates. The expanding markets are Asia-Pacific and proposals for both oil and liquified natural gas are already on the table to reach those markets. For traditional resource extraction, more customers mean more options and higher prices (Canadian oil going to the U.S. does so at a substantial discount from world prices). If we are going to fulfill our potential as an energy nation in the global marketplace, our interviewees identified three critical economic elements going forward: 1) we must improve our domestic environmental performance by investing in renewable energy alternatives and changing how we use our fuels as a country; 2) we must develop the infrastructure that is required to sell our oil and gas to the world; and 3) we must capitalize on our energy expertise and transition to an economic climate where that expertise is one of our primary exports. 2. Balancing the Scale: Sustainable and Responsible Energy in Canada: The concept in the first three words of that chapter title is vital to the central theme of the book: hydrocarbon production and use is not going to disappear for some time, regardless of the alternatives. But if Canada does not start working towards being a leading participant in “balancing the scale” both its prosperity and potential influence will wane. We don’t just need to clean up our own environmental record, we need to learn how to apply the expertise that we do have to developing viable alternatives. The chapter explores a number of ways to do this and I’ll point to just one, albeit it one where Canada already has a model in operation: transforming our cities. The City of Vancouver has set itself the goal of becoming the greenest city in the world by 2020. Progress on the goal is already significant. While the North American average for greenhouse gas emissions is 22 tons per capita, Vancouver has reduced its total to 4.6 tons per capita. The chapter outlines some of the many public policy initiatives that have been put in place to do that. The National Chief is more than willing to admit that there are examples of progress, often in the form of joint ventures between the industry and Aboriginal bands — the problem is that they are best viewed as pilot projects, not a consistent pattern of positive development. 3. Securing the Base: Transforming Energy Prosperity into Canadian Prosperity: Approaching (and expanding) the vision articulated in the book requires much more than simply producing and marketing more energy — if Canada is to achieve the aim of being a global leader the country needs to dramatically expand its research and development capacity and develop expertise in our future workers. In order for the energy vision to become a reality, though, three things need to happen that are not directly related to electrons, carbon, transmission lines or dams. First, as a supplier of choice to the world, the benefits of this need to be seen as more than just making a few companies rich and a few regions able to keep taxes low. Canadians need to see the economic benefits of our energy resources and those with wealth need to be cognizant of how they can use it for the betterment of Canada. Second, we need to improve and develop our capacity for innovating and commercializing solutions for tomorrow’s energy reality. And third, we must have excellent education systems from kindergarten through to post-doctoral programs or we will not have the creative capacity and people power to solve our energy challenges. Okay, I am hardly a neutral observer when it comes to evaluating this book — not only am I married to one of the authors, I had several conversations with the pair as the project unfolded. But I will say, with a passion, that expanded “energy literacy” is vital, not just in Canada but the rest of the world, if we are to find answers to the globe’s most complex problem. Catching a Rising Tide does not pretend to provide those answers — in 93 concise, well-articulated pages it captures the thoughts of 50 very talented people to help expand energy literacy and open a thoughtful, and one hopes productive, dialogue not just in my region of Canada but around the world.